There are now over 2,000 cities with a bike share program. Bike Share examines all the major developments in the 50-year history of bike share programs. The book provides a detailed focus on contemporary bike share programs, including many of the most prominent systems, such as those in Paris, London, and New York, as well as the rapidly emerging dockless bike share sector. This book also addresses how rapid technological innovation, particularly in terms of mobile internet devices and electric assist bicycles may change the face of not just cycling, but urban mobility more generally. By the end of 2018 it is estimated that there are more than 20 million bicycles in the global bike share fleet, with most of these dockless, coming online only in the last three years. Consequently, research examining bike share has not kept pace with the rapid deployment of this new form of urban mobility. The bike share business model, including how ride sourcing services like Uber and Lyft are beginning to integrate their business with bike share service providers. And the future of bike share including public transport smart card integration, mobile payments, and electric assist bicycles. 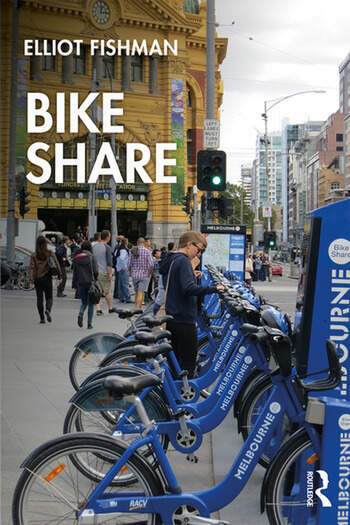 The book provides scholars, city planners, transportation practitioners and students with a resource that captures the most pertinent scientific findings and practical lessons that have been from bike share programs around the world. Elliot Fishman is a transport researcher and consultant who has specialized in bicycle planning and disruptive transport innovation for over a decade. He completed his PhD on bike share and has advised the OECD, the Australian Prime Minister’s Office and numerous government agencies on transport innovation and continues to work as a transport consultant as Director of the Institute for Sensible Transport.